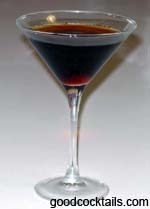 Pour coffee liqueur, dark crème de cacao and amaretto into a shaker with ice. Shake and strain into a chilled martini glass. Add 3 drops of grenadine.